Is the highest and best role of street food to be enjoyed on the street or as the inspiration for higher-end cuisine? Puesto (789 W. Harbor Drive, Downtown) tries to split the difference. Much of what we think of as “Mexican food”—and envision Mexicans eating for their main meal of the day in their homes—is really street food, or antojitos (“little cravings”). These dishes are more mid-commute snacks eaten at street-side stands. Tacos, tamales, tostadas, tortas, quesadillas, gorditas, ceviches and salpicons form the core of one of the world’s most developed street-food scenes. The idea of bringing that scene across the border and putting it in restaurant form is not new. Many have sought to bring classic Mexico City (or Tijuana) street food here, and some have done it well. Puesto has taken this classic idea and dragged it upscale. Where Puesto shines brightest is with its tacos. 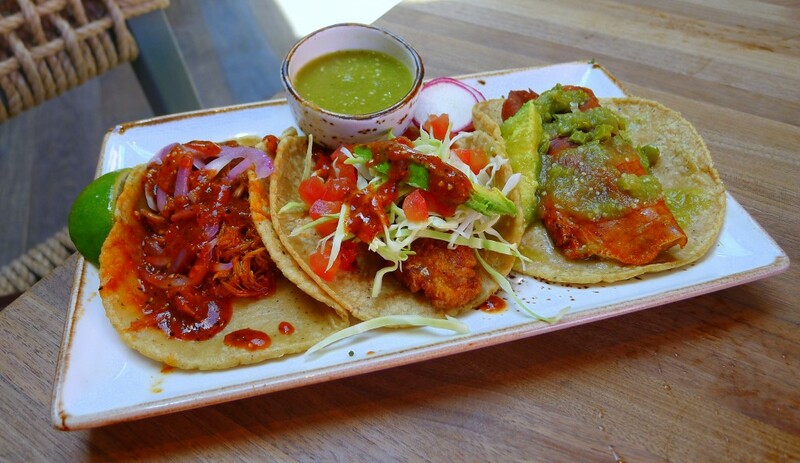 The restaurant, in the new Headquarters at Seaport District, offers 10 different street tacos, ranging from classics like carnitas or conchinita pibil to more luxurious stuff like lobster or filet mignon to vegetarian options like rajas (roasted poblano pepper) or zucchini and cactus. From that list, you choose three per plate. Perhaps the best of these is the zucchini-and-cactus taco, consisting of nopales (sliced and blanched cactus paddle), the zucchini plant’s flower, a wrap of crispy melted cheese and a tomatillo salsa. The acidity of the salsa and the nopales balance perfectly the richness of the cheese. The carnitas and conchinita pibil are good, but they lack the down-and-dirty authenticity of the original, and nothing really elevates them. The same might be said of the Baja fish taco. Frankly, there are better ones in town. The filet mignon taco, on the other hand, is an obvious play at luxury, featuring beef’s most tender cut. But it achieves that tenderness at the cost of flavor. It’s fanciness at a price. A more successful step upmarket is the lobster taco. The fried lobster sitting on black beans evokes Puerto Nuevo—both down-and-dirty and elevated at the same time—with the cilantro crema echoing the lobster’s inherent sweetness and the salsa lending a slight kick. Puesto’s ceviches are not quite as good as its tacos. The ceviche de Acapulco was, frankly, overly acidic to the point that the mahi mahi was rendered flavorless and helpless. The same fish fared only slightly better in the mahi mahi ceviche verde. At least the cucumber and the crema gave the fish a fighting chance. The spicy shrimp salpicon is Puesto’s best seafood antojito. In addition to sweet and rich, perfectly cooked shrimp, the dish includes brunoised onion, tomatoes and carrots and tiny watermelon gherkin cucumbers, as well as serrano chile and avocado. Unlike the two ceviches, it’s a well-balanced dish. Puesto’s Headquarters location is more upscale than the La Jolla original, which hewed closer to its street-food origins. The inherent conflict of street tacos in a swank atmosphere could be off-putting. But Puesto’s flavors, ultimately, carry the day.